Digital Citizenship is a complex concept which often includes connections to health and wellness, legality, safety and security, digital footprint, participation, rights and responsibilities, relationships, literacy and communication. 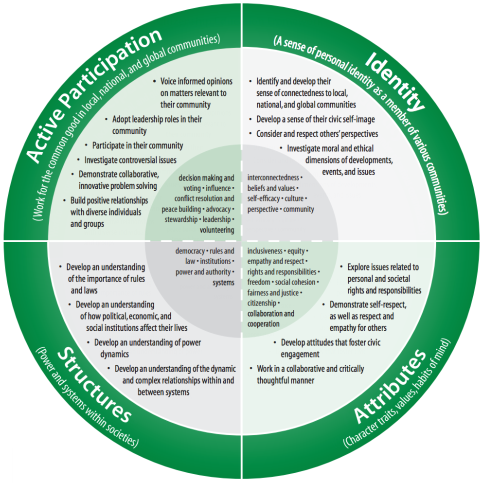 Citizenship includes an awareness of all these elements as well as comportment in digital spaces. The Digital Citizenship network presents NINE themes of digital citizenship. These include digital access, digital commerce, digital communication, digital literacy, digital etiquette, digital law, digital rights and responsibilities, digital health & wellness, digital security and self protection. These encompass the concepts of RESPECT, CONNECT and PROTECT. More is available at THIS link. ISTE provides an infographic that can be used to contrast how being a good citizen compares to being a good digital citizen. The Ottawa Catholic District School Board has produced a document Samaritans on the Digital Road that links digital citizenship to Catholic teaching. The document provides direction and lessons on the five topics in a variety of presentation formats (Smart Notebook, paper handouts, PDF). Check with your own school board for resources similar to this that will shape the teaching and learning of digital citizenship skills in your school and classroom.